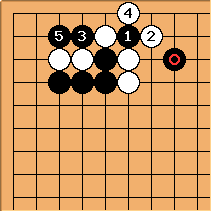 This position comes from 4-4 point one-space low pincer invasion, block. 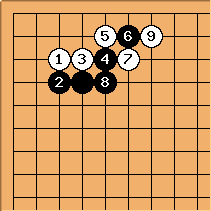 Note that is not a usual joseki move. Should cut at a or b? The correct cut is this , which applies the saying cut the side you don't want, and is also the typical sequence. Next, may be played at either a or b, and the result is favourable for Black. See 4-4 point one-space low pincer invasion, block for more information. here is the wrong cut, and happily capture the cutting stones. After captures the corner, the ends up as a misplaced stone. Note that White has sente now. The remainder of this article uses tewari as an analysis tool to explain why this result is inferior for Black. This is the reference diagram, where we want to show that Black has an inferior position. 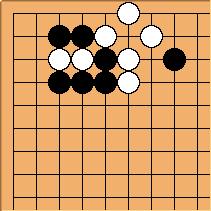 Note that White has sente. 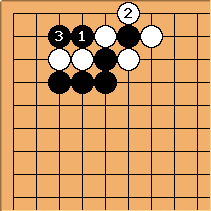 In tewari, we use a different order of moves to arrive at this very position. We use the 4-4 point 3-3 invasion double hane for the tewari analysis. Black chooses to cut at , and ends this joseki. Both sides are about equal. Subsequently might become a big move for expanding towards the center. But instead of playing elsewhere or to start a pushing battle at a, is an absurd move and played in the wrong direction, leading to being a misplaced stone. Note that it is now White's turn, and this position cannot be good for Black. Through tewari, we arrived at a different ordering of moves that leads to the same position as that of the reference diagram. Hence, we conclude that the wrong cut in the starting position in the preamble (a variation of the 4-4 point one-space low pincer invasion, block joseki) leads to an inferior result for Black.